Child care – How are you going to provide more spots? Town hall meetings – Why haven’t we had more? Deer issue – What is Oak Bay and the CRD doing about it? Composting -When is it coming to the rest of Oak Bay? Thanks to everybody that came out. If you missed it, we have another opportunity next Tuesday, November 7th, 7-9pm, at Emmanuel Baptist Church. Thanks to the North Henderson Residents Association and the Community Association of Oak Bay for hosting these. On behalf of the over 17,000 undergraduate students at the University of Victoria, we are sending you this survey comprised of questions that are hot-button municipal issues on our campus. We invite you to fill out this survey and return it to us by Sunday October 30th at the latest. We will disseminate the information provided to students and youth in Greater Victoria. Thank you for your participation and assistance engaging students with municipal issues! Feel free to attach your answers on a separate page. If you have any questions, please feel free to contact us. What will you do to increase affordable housing for students in your municipality? To help provide more housing for students and seniors, I would legalize secondary suites and laneway houses. Also, I would work with other municipalities and seniors levels of government to get funding restored to help build new apartment buildings and student residences at UVIc and Camosun. What are your priorities for public transit, and how do students fit into these priorities? I want to see the Victoria Regional Rapid Transit project, LRT out to the West Shore, under construction within the next three years. I would work with BC Transit to speed buses up using stop reduction and signal prioritization on their busy routes, especially those into UVic. I would also work with UVic and the provincial government to get a new transit exchange built at UVic, as the current exchange is at capacity. Both of these will help students travel faster and easier to campus. What are the solutions to congestion and lack of capacity in the public transportation system? government to step up to the plate and provide some capital funding. However, if it comes as a request of the region as a whole, it is much more likely to succeed. How do students fit into local community development measures? Students are a vital part of a vibrant Oak Bay, and a vibrant Greater Victoria. We need to talk more with students when it comes to the new Oak Bay Official Community Plan and the Active Transportation Plan. What will you do to improve the sustainability of the operations of the municipality? municipally-owned buildings, such as the town hall. I would also continue to acquire, where possible, hybrid and electric vehicles for the municipal fleet. What is your position on bicycling and pedestrian infrastructure? I am strongly in favour of more bicycling and pedestrian infrastructure. 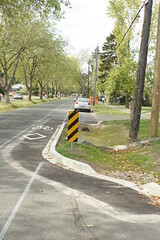 I was a member of the Citizen’s Advisory Council for the CRD’s Pedestrian and Cycling Master Plan, plus I am a member of the Municipality of Oak Bay’s Community Initiatives Committee, which is tasking with improving active transportation in Oak Bay. We recently passed an Active Transportation Plan, and I committed to getting much as possible of the Active Transportation Plan and the PCMP built in the next three years. How do you see recreation services for students in the municipalities improving? We need to continue the region-wide recreation pass, as it has been a great success. We also need to keep offering student rates at our recreation centres. One place where students could play a key role is with inter-generational relationship building from UVic and Camosun to Monterey Centre, which caters primarily to the older population. How will you increase student voter turnout in municipal elections? Are you willing to commit to campus poll stations by 2014? To start, the municipal councillors need to be on campus more, both as candidates and as elected councillors, through teaching and other experiential learning programs. I strongly support campus polling stations in 2014 and would start work immediately to hopefully make that happen. How will you better include youth in decision making process of the municipality? We need to go out and do more community engagement, both using newer technologies, but also going into the places where people already are, which includes both UVic and Camosun campuses. Also, I would support getting more students engaged with the municipality as part of their studies with more experiential learning. What is your position on open data initiatives? restrictions on commercial activity or require onerous reporting. What is your position on harm reduction services? Greater Victoria. But we must remember all four pillars, and continue to fund outreach, detox, and housing for addicts wishing to move on with their lives. What is your strategy for dealing with homelessness and the lack of subsidized housing? What is your position on outdoor camping? I support dealing with the homelessness problem by dealing with the housing problem. More rental housing stock, available to all income levels, is the only way to truly end the housing crisis. I am torn with regards to outdoor camping in public parks in urban areas, because while I support the right to be housed, I am concerned about the long term ecological effects of camping if it spreads into sensitive ecosystems such as our Garry Oak Meadows. How will you increase food security in the region? boundaries. True food security cannot happen without these steps. Within Oak Bay, I support finding more space for allotment gardens. Georgia Strait Alliance and the T. Buck Suzuki Environmental Foundation are conducting a survey of municipal candidates in the Capital Regional District’s (CRD) 7 core areas to clarify each candidate’s stance on Victoria’s plan for sewage treatment. How candidates answer this question will be publicized in advance of the municipal elections with local media, shared with community organizations and made available on the Georgia Strait Alliance website (www.GeorgiaStrait.org), as well as the websites of all three organizations involved. Please also find attached some information on the sewage treatment issue in the Capital Regional District. Question: As a councillor I will support and work positively to ensure a comprehensive secondary or better sewage treatment system for the CRD core area is built before 2020, and that costs are share between local, provincial and federal governments? I support the better option, because one already exists: source control with oceanic sewage treatment. I strongly believe that land-based sewage treatment is environmentally irresponsible, and fiscally reckless. We need to work with institutions, commercial properties, and industries on better source control, as they are a major source of pollutants. However, I am strongly in favour of doing some level of treatment (plus additions of rain gardens) for the storm water, something that many scientists are now saying is a greater threat to the ocean than sewage. I will also say this: If sewage treatment is required of us by senior levels of government, then any such treatment plants should be kept in public hands and run by public organizations, not private companies. UVic, which has been working on a new strategic plan for a number of years, has now presented their draft for review. Don’t get too lost in the civic election, because they want feedback by November 14th. It isn’t a great secret that Uplands Park is filled with non-native species, especially the highly-invasive Scotch Broom and Daphne. Thankfully, there is a group doing something about it: Friends of Uplands Park. Founded by Margaret Lidkie, who has been leading broom and daphne eradication efforts in the parks for years, and Kathleen Matthews, Friends of Uplands Park has granted $1000 by the Muncipality for their continued work. So join them this afternoon from 1 to 4pm. Meet at the info table near Beach Drive at Cattle Point. Bring tools (loopers, pruners, etc. ), wear appropriate clothing including gloves, and most importantly, friends and family. The Rosalind and Morris Goodman Cancer Research Centre, based at McGill University in Montreal, has created an awesome lib dub video to help promote their work, something very near to my heart, after losing my mother to cancer many years ago. Canada’s natural wealth, defined as the dollar value of selected natural resource stocks and land, stood at roughly $3 trillion in 2009. In 1990, it was just under $1 trillion. The media has the power to shape our world, mostly through the words they use to describe the world. I just wish they were a bit more careful when they used that power.